This week’s book pick is The Ring Bear by N.L. Sharp, a picture book for children that I’ve always considered one of my favorites and one that I love to point people to. The Nebraska Center for the Book honored it as one of the best books for children. As a bookseller with a healthy children’s section, I know a lot of boys who are in the same position as Robert, the hero of our tale. Robert loved bears. Real bears and stuffed bears and bears in books. Black bears and brown bears and polar bears. He even loved to eat bears. Graham cracker bears and cinnamon bears and chocolate bears. So he wasn’t surprised when his mom said he was going to be the ring bear in his Aunt Jane’s wedding. When Robert’s told that he’ll be wearing a suit – “a black suit with a tail, a white shirt, and a red bow tie,” he’s pretty sure he has this whole wedding thing down. He’ll look like a panda bear! The boy proceeds to rehearse, on his own, by growling at animals, eating “berries” and drinking “honey” so as to be the very best bear he could be for the ceremony. When finally Robert learns the truth that there are no bears in weddings, a foot-stomping fit ensues. But when Aunt Jane impresses on him just how important he is to the ceremony, Robert relents, becoming what everyone said was the best ring bearer ever. This would be a wonderful book if you need to prepare your child for a wedding or any kind of formal ceremony. And it’s certain that your child will never, ever be fooled about the concept of being a ring bearer. by N.L. 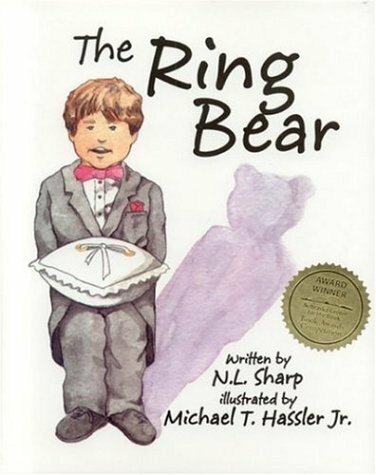 Sharp, illustrated by Michael T. Hassler, Jr.
As the author of THE RING BEAR, I cannot tell you how honored I am to read this great review of my book. It is always fun to read nice comments about one’s writing, but it especially gratifying when those comments come from a bookseller or a librarian. I am writing to let you know that my book has been reissued by a new publisher and with completely new illustrations as a “flip book”. On the flip side is the book is THE FLOWER GIRL, which details Sophie’s experiences in the same wedding. I am including a link to the book on Amazon in case anyone is interested in taking a look at the book in its “new format.” And thanks again for taking time to not only read my book but point folks in its direction! It’s a delightful book … and, yes, I was aware of the twin-book edition. Thanks for commenting. It’s the interactivity, especially with authors, that makes the blog that much more interesting to my readers.